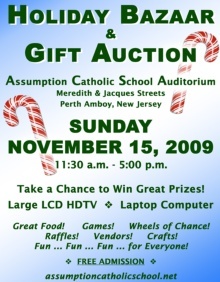 Assumption Catholic School will be holding its 2009 Christmas Bazaar on Sunday, November 15 from 11:30 am – 5 pm, free admission! As usual, the kitchen will be open serving all kinds of delicious hot cooked meals for eat in or take out. Enjoy an afternoon of old-fashioned family fun. There will be games of chance, raffles, crafts, prizes, and baked goods. All are welcome. Bring your friends and neighbors. ACS has been running an annual holiday bazaar since 1968, one of the longest running bazaar's in the area. If anyone knows of a family or business that would be interested in making a donation for the bazaar, or who would like to be a vendor, call the school at 732-826-8721.